This week Michelle from WordPress would like people to focus on One. As she says “Every good photograph needs a focal point. It’s the thing that draws the viewer’s eye and tells the story”. If you want to see what others come up with for this challenge then go to The Daily Post @ WordPress Weekly Photo Challenge. I love trees in winter when you can see the wonderful structure before it is hidden in foliage. It’s nature’s architecture. 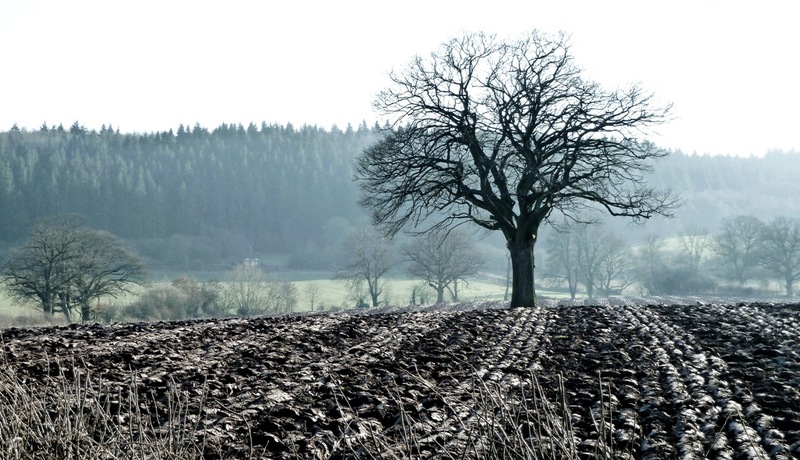 The furrows look hard and frosty, and the texture of the ground really comes across in this photo. Well done Jude, nice shot. I love gnarly old trees. Thanks for sharing. I love this photo! It is very striking and captures the cold winter landscape beautifully! Thanks Janaline, I liked those furrows leading to the tree.